A friend posted this on my wall yesterday morning, the day after the election. None of my bloggers touch the topic of Politics. I am really needing one of you to post something inspiring this morning. I understand why you don’t but I am really dying for some words of wisdom to hang on too… I don’t even care what you voted for. Just some overall words to live by either way… ok, I am done pleading! I wishI had some soothing balm to apply to her soul. She is a compassionate conservative, a lovely young woman, in a liberal bastion of Northern California and I think things got pretty nasty in her neck of the woods. “I’m sorry you have been feeling so much pressure. I am sorry your blue friends and neighbors aren’t being kindly, compassionate, good winners. I am sorry if your red family and friends are being poor sports. For the most part, I’ve been able to avoid it down here. I make it a pretty hard and fast rule that I don’t talk politics with anyone I might want to like the next day – that goes for family as well. People who feel strongly about their party affiliations make me extremely uncomfortable. They have ever since I was about 16 years old and figured out that I didn’t, in fact, have all the answers to the world’s problems. It seems to me that the party ideologues still haven’t figured that out yet. I think people who post rabid support for one party, or one candidate are fooling themselves. I try to never get caught up in politics, because it is almost always synonymous with hypocrisy. No matter who gets elected, the first ones taken care of are the biggest financial backers. Every party looks out for their own. The candidates promise the moon and the stars, with no hope of delivering anything resembling those celestial bodies. If we are lucky, the average citizens get covered in the dust. Everyone talks about the need for bipartisanship, but no one wants to play. People are so wrapped up in their own ideologies that they can’t see what is good, right, or even reasonable in the other point of view. To win, transparency and honesty are impossible for the candidates to uphold and therefore, they are impossible for me to know, or trust. I recognize in myself all these pitfalls. I know I am capable of getting drawn into these same behaviors and emotions, which is why I don’t engage in politics with anyone, ever, if I can help it. I try to take a wider view (for which my father will call me a Pollyanna). I believe that Barack Obama and Mitt Romney are both good, decent men. They love God (as they know him); they love their country and they love their families. In their own way, they have served those ideals faithfully throughout their lives, along with those in need in our country and the world beyond. They might define “need” differently, but they looked to something larger than themselves upon which to base their lives and their work. Their attempts have earned my respect and though I despise the political rhetoric they both spewed during the election season when pandering to their party’s core, they have not quite lost it. I believe we have drifted far from what the founding fathers had in mind. Career politicians working simply to keep their job, at one time congress only got paid for time they were in session. I agree! I don’t think we will ever be able to return to that system, but it was a great idea… Being paid for the work you actually do. Can you imagine??? Being paid for work you actually do?? Wow. I so loved the story you told on your blog last month. To me, you were just a real, AMAZING, awesome individual. Congrats! The respect he deserves as our leader. I think his acceptance speech was amazing! If he is to succeed, he needs ALL of our support. I have to admit I didn’t see it Phi, but I will have to go and find it, I believe. He has beautiful rhetoric…. I have never felt like I had a place to just “be” on someone’s blog. Yes, I have my own political beliefs. Yet, truth be told, I’m not really “political” at all. I just care A LOT about the things that mean a LOT to me. But, there is something about this blog that touches me so much. I happen to believe in God. I wore a Catholic school-girl uniform from K-8. From 9-12, I was in detention weekly at my Catholic HS because my shorts were too short. But, not everyone believes in God and that does not make he or she a bad person. So, the point of my post… is to Thank you for the last part of your blog…I’m quoting below. Ultimately, I know that screaming, shouting and denigrating our political opponents will bring about NOTHING good. I can only vote with my conscience and do my best to live out the values that I profess to believe in: faith, hope and Love. Every day, I wake up and vow to be just who I am. I am just a 34 year old woman who prides herself on integrity. Just got around to reading this. Regarding the picture. 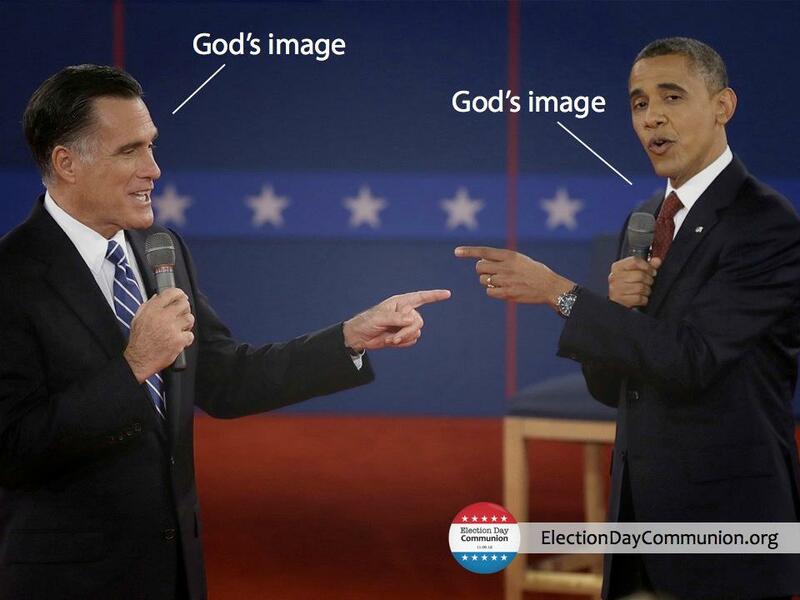 They are both correct, we are ALL made in God’s image. My answer to anyone who claims to be Christian, is to recall the gospel of the hiring in the vineyard. No matter if they were hired in the morning or the last hour, all were paid the same. And them ask “what do you think this means to us today?” And to anyone who asked if I have been born again, (and this is not my own) “Of course, and of course you have given up all, cause I believe that Jesus said to give up all and follow him. I have found out the Bible does give us answers, one just has to think differently.